The Back To School shopping season is upon us, stirring up memories of freshly sharpened pencils, unsullied Trapper Keepers, and the days of having our entire wardrobes selected by our parents. The latter, of course, had its pluses and minuses. This morning, The Onion posted yet another fake news article that rings a bit too true: the story of a mother who decides to step her poor kid's school wardrobe up a notch by thinking "outside the box." Her 10-year-old son, she thinks, needs to stand out this year and wow his peers with his sassy new wardrobe: "If Michael had his way, he'd probably run out the door every day in a T-shirt, jeans, and sneakers," the mother argues, "He doesn't understand that he'd make a much stronger impression on his classmates and teachers if he tried an outfit with more flair, like a nice mock turtleneck with a peach vest." While I laughed at the article, I also cringed a bit, as it reminded me of the days when my mother and I would hit up the mall in a marathon attempt to get all of my back-to-school shopping done in one day. My little sister would come as well, though she didn't fight much with my mother's fashion choices: she just wanted to go to Pretzel Time and look at the kittens in the pet store window. I was the more difficult shopper, rejecting all of my mother's suggestions as "dumb" or "stupid," and rolling my eyes as she lifted up a lace-collared dress or a flowered top. "Lose the attitude, sister," my mother would frown. "You're lucky to even have nice new back to school clothes." She was right, of course. 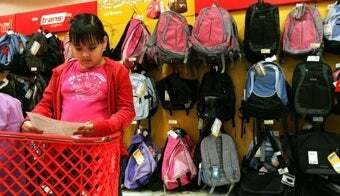 The act of back to school shopping is perhaps one of the events in a young woman's life when she begins to pull away from her parents: "I will not wear that, I prefer to wear this," is a statement that both suggests defiance and a desire to express oneself without a parental filter. When you're very young, you let your parents put you in whatever they please; as you grow, you fight it (and often lose) until you get to the age where you really are on your own, mostly because you are making the purchases with your own money, and your parents accept your style as an extension of who you are. This is not to say that my mother still didn't lay down the law: she rejected many of the hot styles of the day when I was in high school (thank you, Mom) as I was "15, not 45" but compromised by daring to set foot inside of a Contempo Casuals in order to help me pick out trendy but age-appropriate pieces. We fought over what was cool and what most certainly was not, fought over my mother's ideas of style ("You're a blonde, you should wear green. Don't wear black, it's too morbid") and fought over what was or was not appropriate for school. It was a time for both of us to question each other's views on style, yes, but more than that, it was a bit of a generational challenge, and a way for me to assert myself as an adult, all under my mother's supervision. I suspect she let me win many of these battles on purpose, knowing that someday, I'd question the very rules I was making, and that it's not about the clothes as much as how I feel while wearing them. Still, when I had to go to a wedding recently, I was stuck between a blue dress and a black one. "Wear the blue one," I told myself, "black is just so morbid." Sometimes, even when you fight it, your mother's fashion advice wins out in the end. But I'm still not wearing that dumb lace collar, Mom. You can just forget about it.